"Carbon County currently sits in the number one spot for Opioid Addiction in the state of Utah. I am here to try and help get our names off of that list. With my opportunity as Miss Carbon County 2019, I have chosen the platform of “KICK the Addiction”. KICK is an acronym for Keeping Track, Intervention, Changing Everything, and Knowledge of the Addiction. These are just four ways abusers of opioids can start to overcome their addiction. I will begin educating others of my platform by attending County Commissioner Meetings and City Council so they are aware of my effort and will. I hope that they will support my educating the community. I plan to reach out to the schools in the communities, high school, middle high, and even the college level to explain why opioid addiction is a serious threat to the body and mind. I also plan to work with the Health Department and the Opioid Awareness Organization in Carbon County to get more information about the situation to better teach the community about the crisis." Miss Carbon County Collects 1447 Pairs of Shoes for Soles4Souls! Thank you to our Little Miss program contestants for raising 1447 pairs of shoes to be donated to the Soles4Souls campaign! Soles4Souls is a non-profit social enterprise based in Nashville, TN and creates sustainable jobs and provides relief through the distribution of shoes and clothing around the world! ​1000 lbs of shoes for Africa!! THANK YOU Carbon County for helping me raise 1,054 pounds of shoes! A special thanks to all those who were willing to be drop off locations: Encore Dance Studio, Spectrum Paint Supply, Chug Drive Thru, Smith's, Price City Library, Balance Rock, Sally Mauro Elementary and Lydia's Daycare.  Your shoes are the first step in helping the amazing people in Burkina Faso, Africa. The Miss Carbon County Royalty came together and collected 500 stuffed animals through local Elementary Schools for children in crisis in Carbon County. They were delivered to Castleview Hospital Highway Patrolman, Sheriffs Office, and DCFS. These will help children in scary situations have some comfort. Miss Carbon County Aajah Breinholt surpassed her goal of raising 1000 pairs of shoes for the "Shoes For Love" program and raised 2,550 pairs of shoes!!!!!! At the Mini, Little, and Junior Miss Carbon County Pageant. 21 contestants collected 1649 pairs of shoes!! 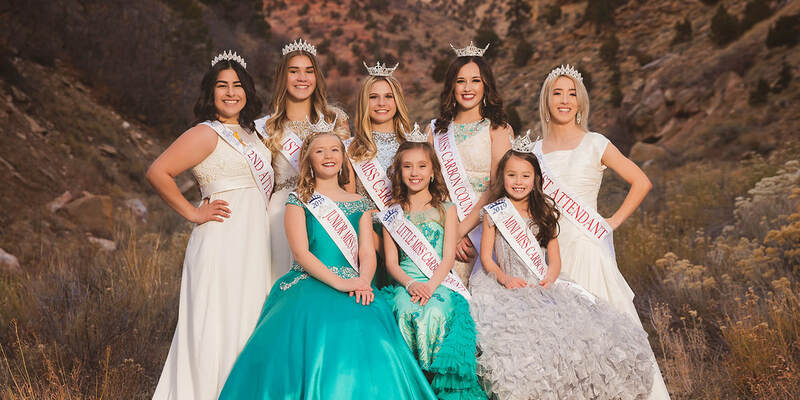 The Glass Slipper Award was presented to the girl is each age group that collected the most Mini Olivia Rondinelli with 106 pairs, Little Gianna Valdez with 168 pairs, and Junior Madisen Justesen with 350 pairs. Shoe drive continues with a drop off box at KUSA Radio Station, Carbon High School Drive, and USU Eastern Cosmetology Drive. Shoes go to people in need in Africa and are sold to raise money to build water wells. Contact Aajah to donate new or lightly used shoes.